Digitalization of documents has become an important technology. 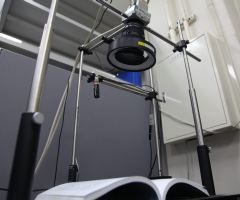 The technical challenge is to realize an easy-to-use, simple, and high-speed scanning system. The key point is how the system can decrease the user's workload when scanning document information on many pages. 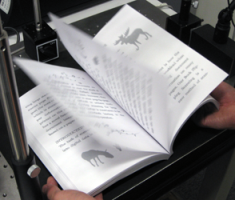 Our Book Flipping Scanning is a new method of scanning large stacks of paper while the user performs a continuous page flipping action. Here we report the core of this proposed technology, which is simultaneous sensing of 3D paper deformation and the information printed on the pages. Our prototype also has a novel function of reconstructing the document image from a distorted one based on a paper deformation model. 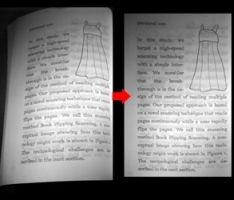 Takashi Nakashima, Yoshihiro Watanabe, Takashi Komuro, Masatoshi Ishikawa: Book Flipping Scanning, 22nd Symposium on User Interface Software and Technology (UIST2009) (Victoria, 2009.10.5) / Adjunct Proceedings, pp.79-80.